Home/Traveling in El Nido/How to Travel From Puerto Princesa to El Nido? 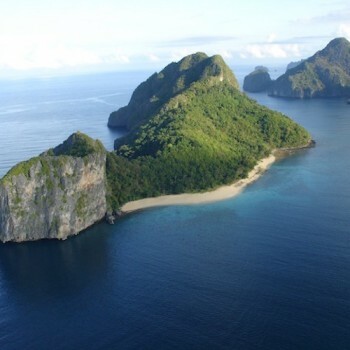 El Nido is located in the north of Palawan, about 230 kilometers from Puerto Princesa. 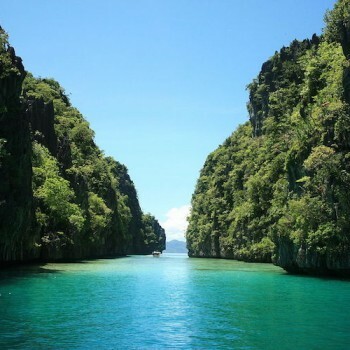 In this article, we will see how to travel from Puerto Princesa to El Nido. What is the fastest way? What is the cheapest way? And how to organize yourself so that you don’t have to wander around Puerto Princesa International Airport to find a van or a bus going to El Nido? I will answer all these questions – and a few others that might interest you as well. You will know how long it takes to go from “Puerto” to El Nido, how much it costs and who to contact to book your trip. 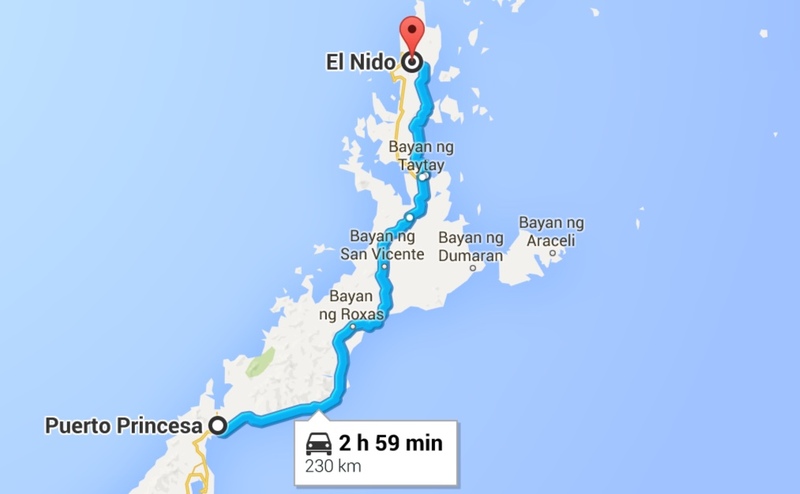 How long does it take to go from Puerto Princesa to El Nido? As you can see, travel times range between 5 and 9 hours. If you checked on Google Map prior to reading this article, this could be a bit surprising for you as Google Map indicates a 2h59min road from Puerto Princesa to El Nido. But it obviously doesn’t take into account the state of the road, nor its numerous turns and hillsides. You just can’t drive at an average of 77kms/hour on this road. For a van or a car, the high average speed would be around 50kms/hour, and for a bus it’s as low as 30kms/hour. That being said, let’s have a closer look to every traveling option you have to go from “Puerto” (the local nickname of Puerto Princesa) to El Nido, with their pros and their cons. For tourists, the van is probably the most popular way of going between El Nido and Puerto Princesa. There are several companies commuting the two towns and each one of them runs several trips a day. Here are the two main ones: Eulen Joy and Lexus Shuttle. As you’ll step foot outside of the Puerto Princesa Airport, you’ll probably be approached by van drivers asking you if you need a ride to El Nido. So, in a way, you won’t have to look for a van… But there are a few things to take into account. What is the normal price for a van ride? People who are used to taking the van between Puerto Princesa and El Nido (locals and expats) will generally get a fare of 500PHP (or even a bit lower). But the prices asked to tourists can be a bit higher. They generally range from 600 to 700PHP. What are the van schedules? After you booked your ticket, you could suppose that you’ll be going soon. But you have to be aware that, most of the time, the van company will wait until the van is fully book to start going. Sometimes, you may even have to wait a few hours (basically, until the next flight has arrived) which can a bit be frustrating. Unfortunately, nobody will tell you that prior to booking. Can they come pick you up at your hotel? 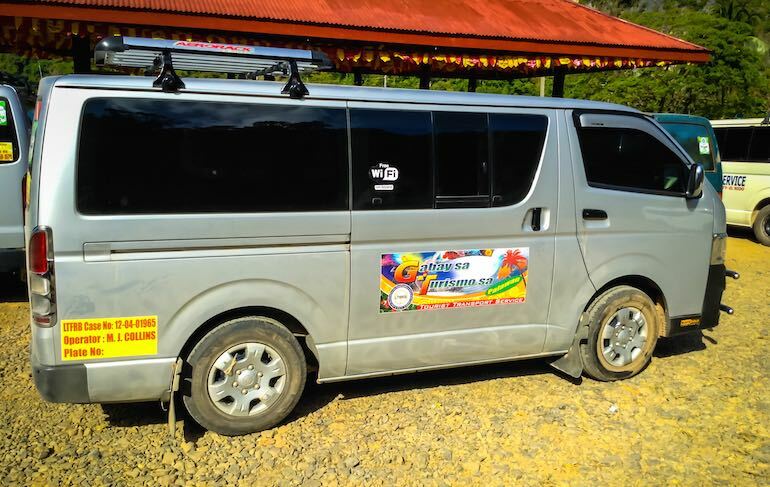 Some van shuttle companies can come to pick you up at your hotel in Puerto Princesa. This is normally the case of Lexus Shuttle. The most tricky part is to contact them without having to go to the San Jose bus terminal (from where Lexus Shuttle operates). The trip follows Puerto Princesa North Road, which goes though Roxas, San Vicente and Taytay. You will then ride along the Taytay-El Nido Highway (which, as of now, is not fully finished yet). About half-way, near Roxas, the van will stop in a “canteen” where you will be able to eat some typical Filipino food. After 5 to 6 hours, you’ll arrive to Corong-Corong bus terminal, which is just a few minutes away from El Nido town proper. You can take a tricycle from there. It’s preferable to avoid walking to El Nido town (especially at night) as there are no sidewalks. Walking on the road is both disturbing for the drivers and exposing you to serious accidents. Is the van ride confortable? The best seats in the van are in the front seat (it’s perfect for a couple, for example) and in the first seat row behind the driver where you will have more space for your legs. Note that these seats are generally the fastest to be taken. Thus, if you’d like to have them, you should ask if they’re still available before booking and duly specify you want to sit there. Most of the vans are air-conditioned (and sometimes even a bit too cold!). Their general confort depends on their age and on the model. For sure, a 20 years-old van will be less confortable than a brand new. If you’re really picky on that kind of stuff, you can still ask to see the van before booking! How to book a public or private van? El Nido Paradise now offers online booking for your van transfer from Puerto Princesa to El Nido or for your van transfer from El Nido to Puerto Princesa. You can access it through the online booking section. If you’re traveling as a group, you can book a private van. The cost is around P6,000 in total and you can now reserve your private van online by clicking here for a private van to go to El Nido, or there for a private van going to Puerto Princesa. New: You Can Now Book Your Van Online! In partnership with Eulen Joy, Barakah Transport and Lexus Shuttle, we now offer online booking for your van transfer from Puerto Princesa to El Nido, and from El Nido to Puerto Princesa (only 600PHP/person). This is the second most popular way for travelers to go from Puerto Princesa to El Nido. There are two companies you can choose from: Roro Bus and Cherry Bus. Both companies operate from the San Jose Bus Terminal, which is 7 kilometers away from the airport. Here is the location on the map. How much does it cost to get to the San Jose Bus Terminal? There is a 10 to 20 minutes (depending on traffic) tricycle ride to go from Puerto Princesa Airport to the Bus Terminal. The last time I checked, the official price (displayed inside the tricycle) was of 120PHP. For Philippines, this is an expensive ride. You may get it cheaper or be able to share the cost if you are two or three in the tricycle. What are the bus fares to go to El Nido? The bus fares range from 380-385PHP for a normal Roro or Cherry bus to 480PHP for an air-conditioned Cherry bus. The prices depend on the model of the bus. They stay the same, no matter the hour of the day or night. How goes the bus travel to El Nido? There are buses going to El Nido every one or two hours during the day. These are the one that can take the up to 8 or even 9 hours. The reason is simple: during daytime they make a lot of stops along the road, especially at the hours when school starts and finishes. In Philippines, you basically just have to stand along the road and wave to the driver to make a bus stop. When the kids are on their way to school or home, the bus will stop many times to pick and drop them off. You should also know that the bus allowance is not limited by the number of seats. Thus, on certain parts of the road, you can sometimes have almost as much people standing in the ally as there are people sitting. After a time travel varying between 6 and 9 hours, you will arrive in Corong-Corong bus terminal, where you can take a tricycle to El Nido town proper. You can get a night bus since the Roro company also operates during nighttime (the last and first departures should be at 10PM and 4AM). If you’re on a budget, this can be a way to save a night at the hotel. Plus, during the night the bus are usually not full and you may be able to get a seat row for yourself (which definitely is better to sleep). During the night, the ride to El Nido can take only 6 hours, because it will make only a few stops. Taking a tricycle to go from the airport to the bus terminal in San Jose (around 120PHP) is something you have to add to the total price. If you get a normal bus, it will add up to 500PHP. If you take an air-conditioned one, it will make a total of 600PHP. As you can see, a bus ride is not necessarily cheaper than a van ride. In any case, it will take you more time to arrive in El Nido. You can find companies to rent a car or a motorbike in Puerto Princesa. Prices for a motorcycle (type Honda XRM 125) will be around 500PHP/day, and a little bit lower if you rent for a longer time. More powerful models will be more expensive, around 800PHP to 1000PHP/day. To rent a car that you’ll be able to drive on all roads up to El Nido, count on 2500 to 4000PHP/day, depending on the model. Driving a car between Puerto Princesa and El Nido can definitely be something you’ll enjoy: the road has very beautiful parts. If you’d like to book a rental car in Puerto Princesa, it’s now possible with our online tool. 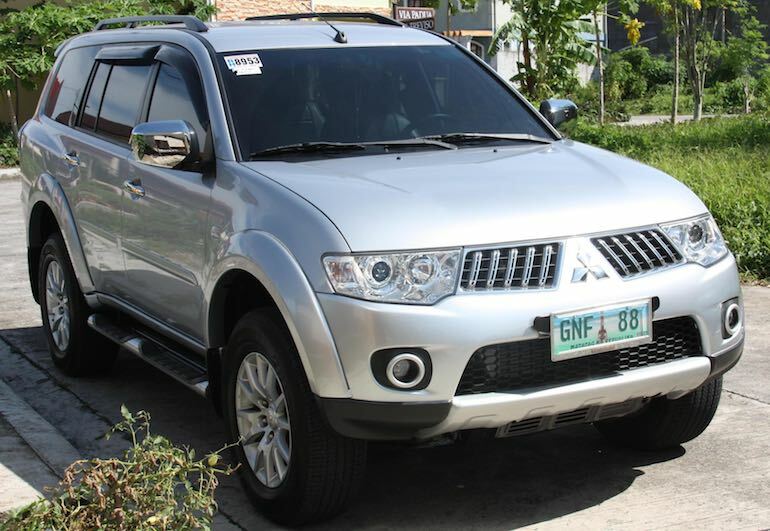 Just click here to do so: Rent a Car in Puerto Princesa. Is it a good idea to rent a motorbike to drive until El Nido? It clearly depends on your motorbike skills. 5 hours on a motorbike can be a exhausting (I did it several times on a XRM 125, so I speak from experience…), especially for a non-expert driver. Above all, you must be aware of the dangers on Palawan roads. There are a LOT of stray dogs and they probably are the first cause of motorbike accidents in Philippines. My only advice is that you drive carefully. And know that if you enjoy riding a motorbike, there are plenty of places you can rent one from in El Nido, starting with our booking (which is located just in front of the Altrove pizzeria). We didn’t speak here of the other ways to come to El Nido (airplane and ferry) and only focused on how to come from Puerto Princesa. The best option is probably to take a van from Puerto Princesa airport. 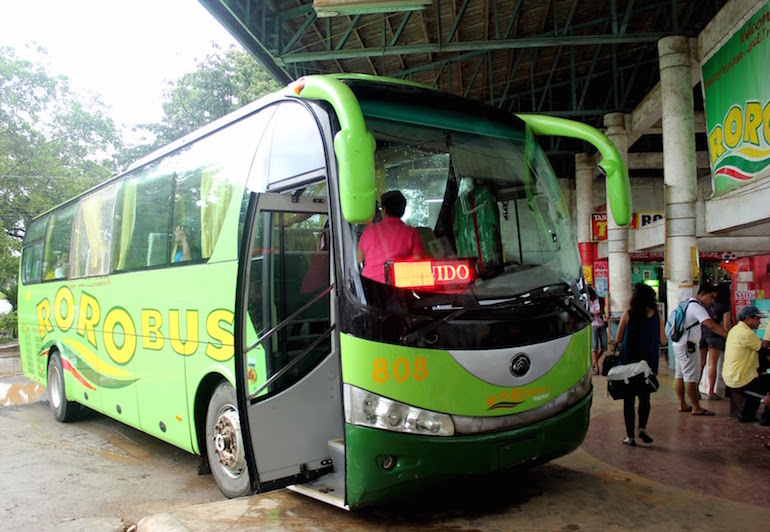 Taking a bus or renting a car can also be interesting solutions, depending on your budget and the time you arrive in Puerto Princesa. If you have any questions, please leave a comment below or to send us a message from our contact page. 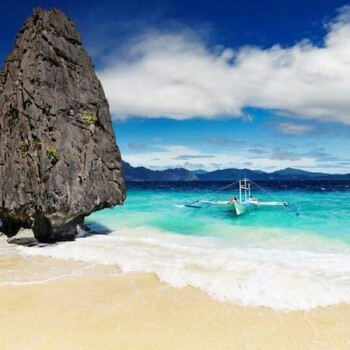 Also, don’t hesitate to check our page on El Nido island hopping Tours and our all-inclusive (transportation, accommodation and island hopping tours) El Nido Tour Packages. I hope this article was helpful and wish you the best stay in El Nido! 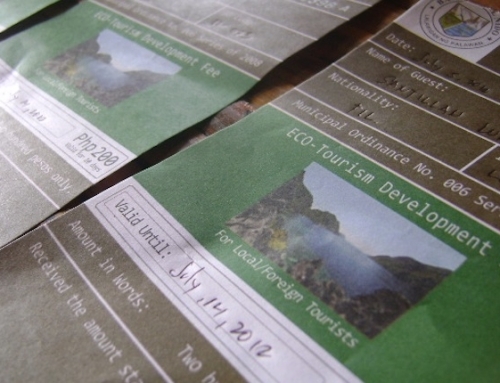 Where can you withdraw money in El Nido, Palawan? First, I’d like to thank you for the info and advice about Palawan island. I have been lookng into transportation options and I came across your website. My wife and I will be flying into Puerta Princessa on March 13, 2016 @ 0230pm, however, I’m not sure if they have any private vans that are heading to El nido around that time. I was wondering if you can help us out. It will be much appreciated. Thanks for your kind comment. 🙂 It’s possible to organize a private van transfer from Puerto Princesa to El Nido. Please just send us an email via the contact page here: https://www.elnidoparadise.com/contact/ We’ll be happy to plan that for you. Please give me an estimated amount for 17 people (2 kids ages 2&4). Is there a van where we can all fit? Thanks for your comment. You can either book two private vans or book 17 seats for public van transfers. In both case, you won’t be able to be all together in the same vehicle because the vans don’t have such a capacity. Thanks for this very informative article guide, we’ll be there in late June, we will stay there for 4N 5D, my question is, is it possible to hire a private van just one (1) way to El Nido and one (1) way going back to Puerto? Thanks. Yes, it’s possible to hire a private van. You can find all the routes offered from this page: Private Vans in Palawan. Thanks, and have a great stay in Palawan! Does this also apply to motorbikes? For the motorbike, we don’t offer any at the moment but it’s possible to rent a motorbike in Puerto Princesa and drop it off in El Nido thanks to https://www.rentacarpalawan.com/ The other way around (El Nido to PPC) is not offered by anyone at the moment. The best would probably be to rent the motorbike in PPC and return it in PPC. Hi , we arrive in Puerto Princessa at 12:45 on the 9/4/16. Hi, I will travel to Puerto Princesa on this Aug.08 and be staying there 2 nights. On Aug.10, I’d like to go to El Nido so can you please help to advise on which vehicle should I take (check-out at the hotel at 12pm)? Also, I’d go back to Puerto Princesa from El Nido on Aug.12 to take the flight back to Manila at 6pm, can you also help to advise on that? Thanks much for your kind support. The most efficient way to travel is between Puerto Princesa and El Nido is assuredly the van. Hello, i would like to know if you get the tickets on email? Yes, and we send you all the practical information by email too. Hi, I just want to ask if there will be no problem if I will bring my son (3 years old) going to el nido? I mean d package tours? I’m thinking that there might be age restrictions. Thanks a lot. There’s no age restriction for kids that I know of, except for special activities like cliff climbing, etc. 🙂 Note that for going to El Nido, the van will allow your kid but you will have to book one seat for him, at the normal rate. Is there a night trip if we take the van? Nope, except if you take a private van. Hello, How much will it cost us to hire fully air conditioned van for eight people – no more no less? The rate for a private van is P6,000 for one way and P11,500 for the round trip. We will be visiting El Nido in Jan 2017, with the van for P11,500 round trip- how many seats is that? There’s up to 12 passenger seats in a van. We’ll visit El Nido in Jan, 2017. I would like to book your service but I don’t have Paypal. Actually, you don’t need a PayPal account to use PayPal. You can use it with a simple credit card. Just click on “Proceed with PayPal” on the checkout page, and on the next page, click on “Pay without a PayPal account”. Im planning to go to el nido in january and was wondering if the roads are narrow and close to a ravine and if its zig zag. Im afraid of heights and narrow roads and winding roads. Please advise. Thank u. The road to El Nido is now fully built and the work to enlarge it have already started. It should soon have two lanes on each side, at least on some parts. The road doesn’t have “scary” parts per se, but it does zig-zag in certain areas. We will be in Palawan next week and we’re wondering if the public van can accommodate luggages? Luggage for 7 person? What time is the last trip of van going to el nido? 6:00 PM (except if you book a private van, of course). The trip takes around 5 to 6 hours. So you should go very early from El Nido to catch your flight. Very useful info – when you say that the van takes 4.5 – 5 hours is that actually accurate? My experience in Asia is that it’s always a couple hours more or longer than what we are initially told. You’re right, I edited the article to reflect it. 🙂 The trip generally takes 5 to 6 hours. We will visiting El Nido this coming April, 2017 via Puerto Princesa. Kindly advice ussince we are also planning to visit underground river. Which do you think we’ll go first. El Nido or the Underground river. I would advise to do the Underground River Tour on the way (either to PPC or El Nido) so that you don’t loose one day with the van transportation. We have the two routes available: Underground River Tour (route from PPC to El Nido) and Underground River Tour (route from El Nido to PPC). Is it possible to get picked up from the airport in PPC if doing the Underground river tour to El Nido? Yes, it is. But note that the public tours will basically depart before the arrival of the first plane, so it should be for a private UR tour to El Nido (you can find it here). Ang last trip sa El Nido ay around 6PM. I would like yo ask if there is a possibility of rent a motorbike in El Nido and return it in Puerto Princesa? just stumble upon your informative website, we are visiting Elnido for the 2nd time on the 24/04/17 till 27/04/17 all accommodation and domestic flights now arrange, currently cannot get hold of a friend who booked our trip to Elnido last year so I resorted of doing all the arrangement by myself I would appreciate if you can advise if there is a private van for 6 people all adults available to take us to our hotel in Elnido and pick up from Elnido to Puerto for our return journey and how much? appreciate for your assistance – thank you ! Hi, as I saw comment above about visiting underground river on the to or back From El Nido to PPC. I am interested now to visit that river on the way back from El Nido. Hello, my partner and I are coming to Palawan in October. Is is possible to hire a car for a one way trip from PP to El Nido? Would you recommend staying a night in Roxa to break up the long trip? Are the roads dangerous for a foreigner to drive? We are from Australia. Is there a way to drive to El Nido from the Underground River without having to drive back into PP? I am looking to travel to El Nido tomorrow from Puerto Princea but would also like to stop to see the underground river. Do you know of any company’s that would do this? Yes, you can book the UR Tour with this route here: Underground River Tour (from Puerto Princesa to El Nido). Hi! I would just like to ask what time is the last trip of the van from airport going to el nido? we’ll arrive in puerto princesa airport around 2:30pm I’m thinking if we should go straight ahead to el nido and then have our tour in puerto princesa before going to manila instead. I hope you can give me some tips. Thank you so much! You can verify that info on the van booking page but in any case at 2:30PM there is no problem to get public van from the airport. Your article has been very very helpful! Thank you so much already! If I and my 2 friends took a van to El Nido, Where does the van drop you off at, and how would we then get to our lodging? Also, how/where would we find a van to get back to the airport? Yes, the public vans stop at the bus terminal of Corong-Corong, from where you can get a tricycle to go to town. You can find them here: Public Van from PPC to El Nido. To get a van back to PPC, you simply have to buy a ticket. You can reserve it online for the route El Nido to PPC on this page. Hello we are going to Puerto Princesa. Next week. We are thinking of going to El Nido for a day tour. Like travelling at Friday night to El Nido and going back to Puerto Princesa on Saturday afternoon? Is that possible? That’s a lot of van on only two days but yes, it’s totally doable! Hi very useful tips on how to travel. We want to first do puerto princess for a day then go to el nido in the evening of sept 11th. If we rent a car or jeep to el nido where do we drop it off? If we choose van can they pick us up from our hotel in puerto princess? Yes, the pick up at your hotel in Puerto Princesa (proper town) is possible with your van transfer. For the car rental, you can contact us to get more info about the possible drop off options for your planned itinerary . There is no ferry going from Puerto Princesa to El Nido. The common way to travel between these two points is the van (either public or private). How many liters of gasoline will take if i use Toyota Wigo on rent a car going to elnido from puerto princesa? On a general basis, for a diesel vehicle, you can count around P1,000 to travel the road from Puerto Princesa to El Nido. If it’s a city car, it will be slightly lower than that, maybe around P800. Thank you for the info, helped us a lot while planning. My boyfriend and i will be travelling to El Nido this December. We are actually planning to rent a private car from Puerto, however both of us dont feel like driving all the way to EN for this trip. Is it possible that we can rent a car and hire a driver as well? For the public vans, it’s 6:00PM. For the private van, it can be at any time. In that case, please just coordinate in advance through our contact form. our return flight is too early,may i know what is the first bus departure from el nido ? Thank you the very helpful info. I read about the UR Tours from-and-to PP and I wonder what to do with our luggage during the tour. Also, if you can recommend a hotel/resort at reasonable price in EN. Yes, it’s the price for the van hiring, for 1 to 12 persons (max capacity of the van). 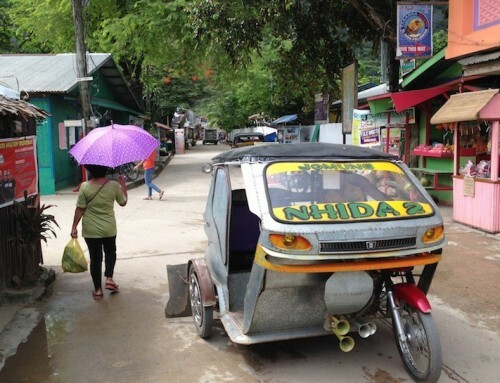 You can get picked up wherever inside Puerto Princesa proper town limits. Same thing goes for drop-off within El Nido town proper limits. What if we booked a flight which arrives late in the afternoon in pps, or flight was delayed? 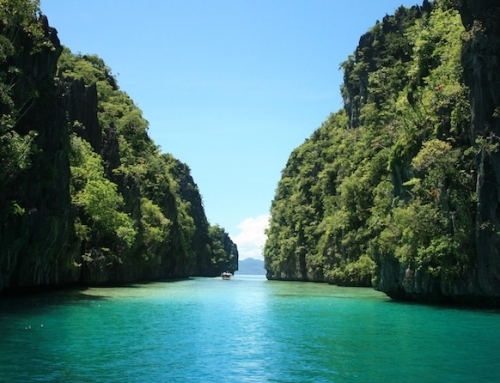 As i have read there are night time trips to el nido… How about check in time of the hotels? Last departure time for the public vans is 5:00PM. If you plan on arriving later than that, you can always book a private van (available until 9:00PM). If your flight is late, you must let us know by calling us. If it’s a public van transfer, it can be rescheduled to the next day. If you booked a private van, just let us know by calling us as well and the driver will wait for you at the airport to bring you to El Nido on the same day (provided your flight doesn’t arrive past 9:00PM – which is normally the case). For the hotels, we cannot answer, the best is that you ask to the one(s) you booked what is their check-in policy. We wish you a good trip in Palawan in any case! 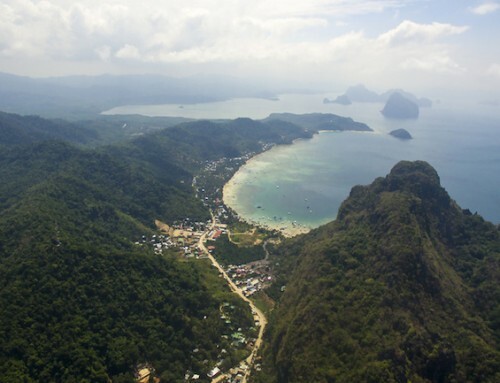 El Nido, Where can I rent a motorbike? Would like to rent it out for a week, do you know cost? We are also looking for quiet place to stay, on the beach or on the hill, prefer clean, better management bungalow, any suggestion? We want to try a night or two in a nice resort, bungalow on the water that won’t break our wallet, any suggestion on that too? We’re arriving on May 18 at 4pm, cos’ our flt is a bit late to go up the El Nido, ll probably spent a night at PP then catch an early van up to El Nido. Hello, I’d like to ask if in case of bad weather, will there be a refund to our scheduled tour? PPC and El Nido are around 5-6 hours away from each other, so if you want to do some tours in El Nido, it’s definitely better to stay there for at least a couple of days. Hello, I would like to know what’s the fastest way from Puerto Princesa to El Nido at the moment? Thanks a lot! Thanks you so much for this! Very informative and certainly influenced my decision on my tavel plans to El Nido! How much is pertrol in Palawan if one were thinking of hiring a car for a few days? Currently between P50 and P65/liter depending on the type of fuel. Hello, If we go straight to UR from the airport, is there a place where we can leave our belongings? since after the UR we might travel straight to El Nido. What is the best way to do- Visit the UR on our first day or last day before going to the airport from El Nido? Thank you in advance. Hello, is there an extra charge for the baggage? Hi, if we will take the first early flight from Manila to PPS, is it possible to spend the day at PPS then take the 10pm bus to El Nido? If yes, what PPS tour would fit this sched? This is very informative article and it really helps a lot.. Thank you very much! By the way, any specific location or accommodation that you can recommend once arrived in el Nido? Hi, can you take your luggage with you on the van – are there any restrictions. Thank you.